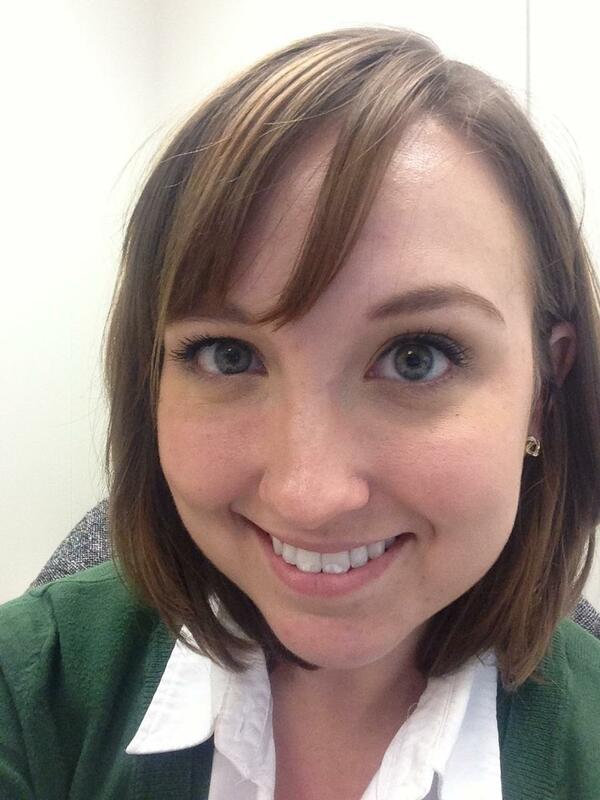 Hey hey hey, how about that three-day weekend? I've been mostly studying, but I did manage to do a little DIY organization with my bonus day. I had originally made myself a magnetic makeup board out of a dry erase board that FAILED MISERABLY. Turns out, dry erase boards just aren't strong enough to hold up makeup with much weight, no matter how many magnets you put on the makeup. SO, since everything had reduced itself into chaotic disarray, I thought... why not Velcro? My original game plan was to buy some foam board, cover it with felt using some fabric spray adhesive, then attach the hook side of the velcro to my makeup and stick it straight to the felt. The velcro was just too strong for the felt and ripped it away from the foam board. Plan B: Assign everything its own spot on the board and stick the fuzzy part of the Velcro to the foam board. You wanna do this too? ALRIGHT, LET'S DO A TUTORIAL BUT WITHOUT PICTURES BECAUSE I FORGOT TO TAKE THEM ALONG THE WAY, WHOOPS. Step 1: Figure out where you want to put this bad boy. Measure that area. Measure that area again. Okay, one more time. Good. Write those numbers down. Now you should know how much foam board you'll need. Step 2: Evaluate your makeup stash and figure out about how much velcro you'll need. The Velcro I used is sold in 18", 5', and 15' rolls/strips. You're probably not going to need 15' unless you're doing your entire bathroom wall. I bought the 5' roll and had about 2 feet leftover. Do whatever is most cost effective for you. Step 3: Go to the store and get the things you need. Here's a list of things that might be handy! Foam board: I got mine in this size at Michael's for $2.99. You can also get colored boards if you so choose. Velcro: I recommend NOT buying this at Michael's. It was a good $3 more expensive there. Also, make sure you get the STICKY BACK kind and the 3/4" width. It sometimes comes in different colors but I didn't really care and just bought black. A box cutter/exacto knife: You're probably gonna have to modify that foam board. A straight edge and pencil: So you don't end up with a jankety edge on your foam board. Scissors: to cut your velcro. Hammer and nails: To mount this buddy to your wall. 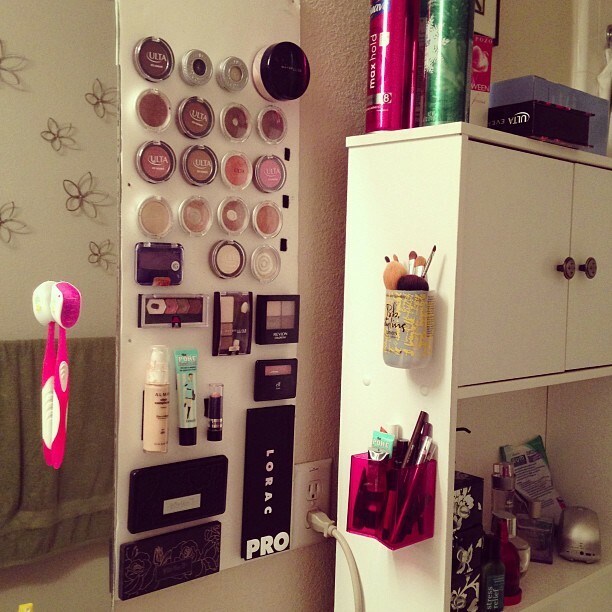 Command strips: To mount your brush/eyeliner/mascara/whatever cups to the wall. Some creative thinking to figure out what to use for your brushes/eyeliner/mascara. I didn't want to go spend money on actual pencil holders so I improvised. I had an old pink square pen cup that was handily divided and decided to use a recently finished bottle of hair stuff for brushes. Other options might be a soup can (cleaned and ensuring that the edges aren't sharp) or an old pill bottle/vitamin bottle. Bottles like that are great if you can manage to chop the tops off with the exacto knife like I did with my hair stuff bottle. But the important part is to figure out how much stuff you have that you need to put in those cups and make it happen. ANYWAY. Step 4: Now that you have all your stuff together, cut that foam board up. measure it out to whatever size you need, mark it off with a pencil and make sure it's even, and cut that thing to size. 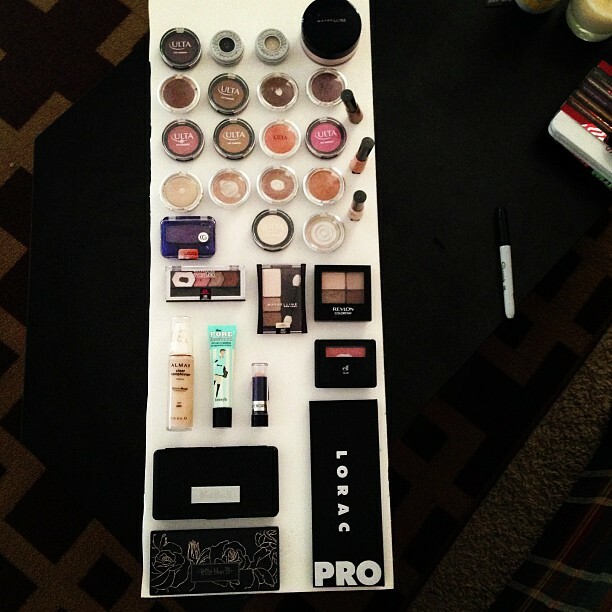 Step 5: Get out all your makeup and lay it out on the board. Organize it so it's aesthetically pleasing because this is what you're going to be stuck with. Literally. There's all my stuff laid out on the coffee table. Step 6: Once you have all that settled, it's time to get to Velcroing. Take the Velcro you bought and attach the hook sides to the loop sides all the way down so it's nice and even. This should result in the velcro being stuck together and the sticky sides on the outside. Evaluate how much velcro you'll need to attach each item to the board (more for palettes, less for individual eyeshadows, you get it). Cut a length of velcro to match the item you're working with. Peel the sticky back off of the hook side and stick it in the middle of the item. Then peel the sticky back off of the loop side and stick it to its assigned spot on the board. Repeat with everything. When you do it this way, with the velcro already attached to itself, you can make sure that your makeup is perfectly lined up where you want it and you don't have to go trying to line it all up AFTER you cut it. Makes everything nice and uniform. Step 7: Mount that baby to the wall! I used two nails each at the top and bottom and two nails along each side (since mine is super tall) in order to keep it stable. Mount your brush/eyeliner/mascara cups nearby using your command strips. Step 8: Pat yourself on the back because your makeup looks awesome now and you're no longer taking up all the counter space and irritating your boyfriend. All in all I spent about $10 on this. To be fair, I already had the exacto knife, hammer, nails, cups, and command strips, but it's still crazy cheap considering how helpful it is!